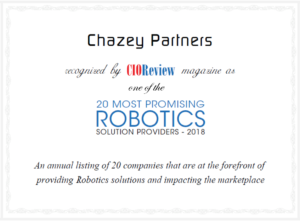 Chazey Partners, a global management consulting firm specializing in Shared Services, Business Transformation and Robotic Process Automation (RPA), is proud to announce that it has been listed by CIOReview magazine as one of the 20 most promising Robotic solution providers of 2018. CIOReview is a technology magazine at the forefront of guiding organizations through the continuously disruptive technology landscape, enabling enterprises to redefine and realign their technology, processes and operating models to support the needs of tomorrow. To help companies understand the RPA solution provider landscape, the CIOReview editorial board, along with a panel of prominent CEOs, CIOs, VCs and analysts, assessed several Robotics solution providers and produced a list of the 20 most promising providers in 2018. 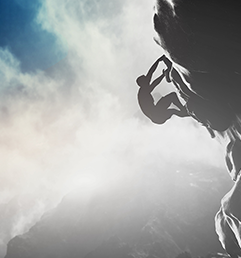 Chazey Partners’ significant, practical experience and its proven transformation methodology and approach to RPA implementation combined for a top 20 ranking. Founded in 2006, Chazey Partners operates across the globe, with regional offices in 12 countries. The company supports public and private sector clients with shared services, business transformation, technology enablement and digital transformation. Its integrated Robotic Process Automation solution offers clients a range of RPA services, including RPA assessment, RPA Proofs of Concept, vendor selection, RPA business case and roadmap, RPA Center of Expertise design and implementation, and RPA development, testing and training. 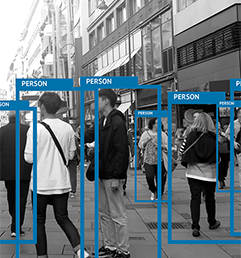 RPA is a software solution, commonly referred to as “bots”, which mimic or automate tasks normally performed by humans interacting with data between systems. As organizations continuously strive to achieve more streamlined operations and leverage the significant volume of data available today, RPA is one of the latest automation propositions that promises a quantum improvement in the quality and efficiency of business processes and service delivery. Craig Ackerman, Global Head of RPA, Chazey Partners, explained: “Automation and digitization are becoming more and more of an organizational imperative for businesses everywhere. However, as with any change, implementing RPA still needs proper planning, engagement with key stakeholders, clear management of change and human resources, all supported by new operating models and frameworks in order to function optimally. Business are going to quickly fall behind in this technology revolution if they do not have a trusted partner to help understand, assess and implement RPA”. Click to learn more information on Chazey Partners’ Intelligent Automation solutions. 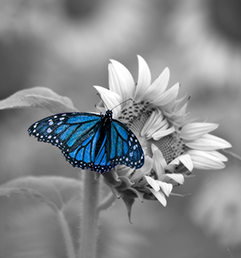 Chazey Partners is a practitioners-led global management consulting and advisory services firm. We bring a unique blend of real life, practical, hands on experience, empowering our clients to strive for world class excellence through Shared Services, Business Transformation and Intelligent Automation. We pride ourselves in helping businesses and public sector organizations achieve operational excellence in the delivery of mission-critical business services; including Finance, HR, IT, Procurement, Facilities Management, Customer Helpdesk, and many other support services. For over twelve years, Chazey Partners has helped our clients implement successful service delivery solutions; in the US & Canada, Latin America, Europe, Middle East, Africa, Oceania and Asia.